* Always fresh, fragrant and delightful. When you need a decent flower bouquet does your garden produce flowers for cutting? There are many occasions when desirable flowers are either out of season or they cannot be produced at all in a cool climate garden. These include greenhouse grown exotic blooms for which I have a separate page on this link to help guide your choice. But don't worry - high quality flower bouquets are available from here so that you can provide your loved ones with surprise floral gifts and decorate your home with flowers at any time of year - even in winter. Much as I love to grow my own for cutting, when I use these flower sellers I don't have to worry about packaging. 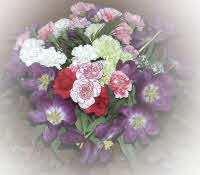 Moreover, when you buy these floral arrangements to send to a friend you can be sure of getting something extra special. Note that some of the American flowers bought from this link actually come in small vases of water to keep them fresh. how to prepare your flowers to make your blooms last longer - see below. make the shape of your vase conform to the space available for your floral display - different vases will suite narrow shelves, or large tables or small tables. choose a shape that compliments the shape of your chosen blooms - tall vases are for tall spiky inflorescences, and round shapes to balance full globular headed blooms. If you live in the UK - check out this amazing self-moulding vase - you can remould them when warm - they set solid when cold. Flowers and Vases for your home are here. Clear Crystal Vases: clear still water gives your decor a sense of purity. Cut Glass Patterned Vases: work well in sets and as sparkling focal points. But with an eye on shape and color see the decorated vases below. Painted and Decorated Vases: in many forms they are well-used to blend in with your room decor and wall color. They come in creative shapes to fit narrow spaces. And in themselves they are handsome works of art. find handsome vases here. Rose Bowls: round shapes balance and harmonise with the full rounded shapes of blooming roses. They are especially suited for tables. Short Stems: to highlight a single stem such as Gerbera or an Orchid - some are wall mounted. - find more vases here. Taller Vases: for long-stemmed flowers, spiky blooms and grasses. They're also used with long-stemmed roses. Tall Urns: may be used for suitable dried flowers, grass and twig arrangements. There are numerous 'old wives' tales on the subject of additives to vase water. You'll read advice about adding bleach, aspirin, lemon juice, vinegar and more. If I had to choose one, it would be real lemon juice, because that includes sugar, some anti-bacterial action, vitamins and organic acids like those in natural plant sap. Professional information to help you care for cut blooms will be on this link soon and outlined below. Check what professional florists say you should be doing on this link. Greenery from conifers, holly, ferns and palms, as well as small misty looking inflorescence like Gypsophila make an ideal background for the main display of bold bright coloured blooms. You need some wire, such as a coat hanger, bent into a circle to form the frame. Small wire ties are used for twisting around stems and with greenery to hold it into place. Ribbon and glitter may also be useful. Florist's accessories - including wreath rings, sponge, scissors, ties... can be found from these links. Florists use a sponge known as Oasis. The makers claim that Oasis Maxilife meets or beats the life of flowers in a vase of water. Stalks are inserted into Oasis which can be easily cut and placed into the bottom of a vase or dish. Although dried floral arrangements lack the vivacious immediacy and romance of living blooms and flower bouquets, they do last much longer. However, their main advantage is surely the unique shape and architecture they bring to your decor. Indeed, dried seed heads, cones and grasses, twigs, logs and bark cannot be missed by those who enjoy an earthy natural style for rooms and furnishing. You can find flowers sent in water on this link. You can find a nice selection of vases on this link or click below. DirectGardening.com - Offers quality plants at great prices, click to see what I mean! Try Bunches.co.uk - they support the ethical voluntary code Florverde, set up by the Colombian Flower Growers Trade Association. Start here to grow your own blooms for cutting. The Home Of The Organic Gardener - growing naturally, pure and beautiful. ﻿ By Michael E. J. Scott. Copyright © The Organic Gardener.Com 2004 - 2019.